We arrived in Shanghai ready to be disappointed. It seemed every traveller that came before had had such an experience and reported it to be "a city like any other, only the people are ruder." 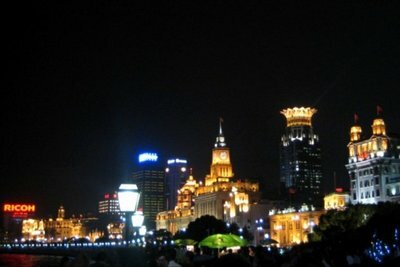 As we set out into the starry night for a stroll along the water front "Bund" district on our first night in town, we found ourselves immediately charmed by the glitz and glamour of a city from another world. Nowhere to be found was the cold concrete of New York or the rude pushy urbanites we had hear about. 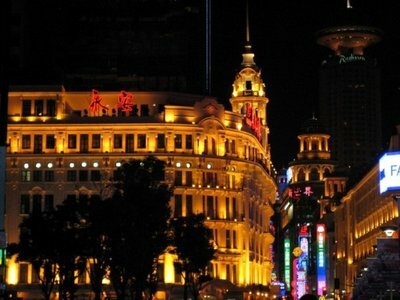 Stunning European style architecture glowed with soft yellow lights amidst elegant cafes and upscale boutiques. Not a tree was left untwinkled, not a strolling couple unenchanted. It was a bit like walking through a Disney land version of the Champs Elysee at night. And then we did what no traveller should ever do -- we attempted to follow a lonely planet guidebook suggestion for dinner. The oft unreliable LP lead us to a "food street" claiming to have heaps of offerings at reasonable prices. We bravely ventured off the beaten path through back allies and side streets, hungry and hopeful for a perfect cap to our evening. We found the street at last - it's neon somehow dimmer, it's air somehow thicker. Within steps, all of the glitz of three blocks back seemed to melt into grime. Wading through trash and numerous offenses to the nose, we passed child beggars and a myriad of unseemly characters mixed in with elegantly dressed hostesses unenthusiastically vying for our business. We settled on a small, simple looking restaurant because it appeared to have several Chinese patrons inside and the waitress insisted they had plenty of English menu items. Once our food arrived, the entertainment began. The Chinese patrons we had seen were actually just the staff who sat at a large table blocking the exit route enjoying their evening meal and the sight of a man getting a public beating a few feet behind my chair. It was our guess that the gentleman who was receiving the incredibly loud, make your heart jump into your throat, blows one after another without resistance had somehow wronged the establishment earning him this public display. As the mafia like man (complete with leather jacket) punched, slapped, and kneed the thief to the oohs and aahs and occasionally gasps of the staff, our appetites quickly declined and our heartrates quickened as we searched for a safe time to exit. Finally kicking him out the door after what seemed like hours of abuse, our waitress issued a quick apology and giggle as we asked to pay and leave. So this was Shanghai. Take it or leave it. We had two more days in the city however, and not ladies to be deterred by a little dirt and squabble, we set out early the next day to enjoy some fabulous gardens and walks through the old city. The following morning we took in the city's satisfying Shanghai museum filled with truly stunning exhibits of ancient Chinese sculpture and ceramics and topped off our last evening with a night on the town at one of Shanghai's most renowned jazz clubs. The resident band, hailing from Mauritius and Paris, was unfortunately stationed there on a 4 month, 6 night a week contract (so we were told later by the band's lovely albeit not quite there bassist). The blond Parisian singer took her position as lounge singer to embarrassingly cliched extremes that raised many an eyebrow (well maybe it was just us who found her so amusing). We smiled in corner seats nostalgically as the band (sometimes triumphantly and sometimes miserably) worked their way through jazzy show tunes, unexpected rock hits, and took many interesting liberties with the American standards. It was nothing if not entertaining. 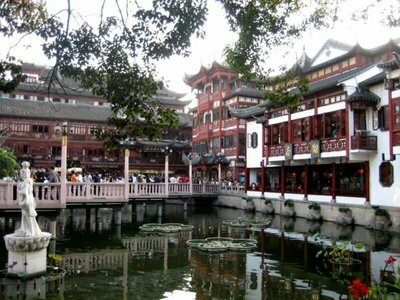 In the end, Shanghai did not deliver the resounding disappointment we had expected. Instead it gave us a glimpse into an unexpectedly Moulin Rouge-y side of China that strongly contrasted both the slow routine of the countryside and the traditionally dignity of Beijing. Shanghai was once considered a center of sin and debauchery and, as we learned, remains a thriving center of many of the country's opium dens, gambling joints, music clubs and prostitution hubs -- these days they are simply hidden in the shadows of glimmering hotels and department stores, tucked behind twinkly light soaked tree lined streets and romance inspiring candle lit cafes. Paris of the East, Whore of the Orient, Shanghai manages to be both with ease.